The Reflector, one of Dublin’s most iconic new office buildings, has been brought to the market with a guide price of €155m. The sale is being handled by Savills Ireland and CBRE on behalf of Park Developments, who anticipate a strong level of interest from European and international Investors. 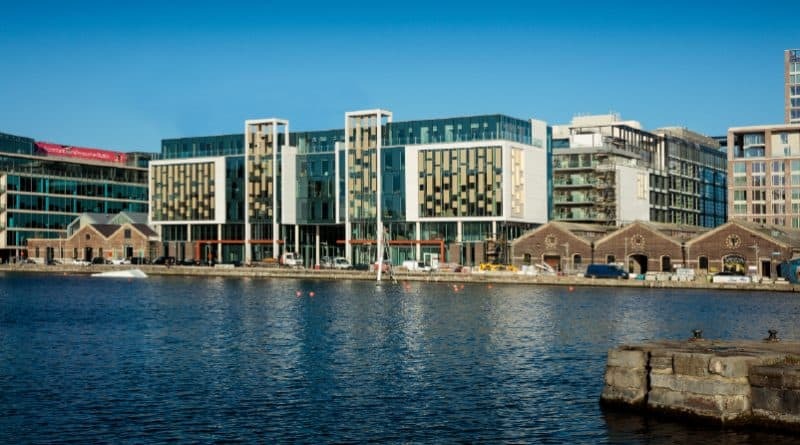 The Reflector is a landmark office development – which completed in 2018 – and is prominently situated in Dublin’s Grand Canal Dock area, with impressive water frontage spanning almost 75 meters on Hanover Quay. The building has attracted quality tenants such as Airbnb, Wix and LogMeIn, it will produce an annual rent of approximately €7,000,000 and WAULT of 12 years. The six-storey over basement building comprises 11,250 sq m (121,089 sq ft) NIA of office space and 329 sq m (3,546 sq ft) of retail space, with 34 car parking spaces. The building is split into two wings (East & West) with individual receptions and centralised cores offering maximum flexibility. The building is finished to the highest standards with superb levels of natural light and generous floor to ceiling heights of 2.75m on standard floors and 4m on ground floor. The development will achieve a LEED Gold V4 accreditation and A3 BER. The East Wing comprises of 3,012 sq m / 32,416 sq ft of office space let to LogMeIn with a guarantee from LogMeIn Inc. A restaurant/café unit of approx. 329 sq m (3,546 sq ft) is located on the ground floor of the East Wing. The West Wing comprises of 8,234 sq m / 88,673 sq ft of office space, tenants include Airbnb (with a guarantee from Airbnb Inc), LogMeIn and Wix.com Ltd. The combined rent roll will be approximately €7 million per annum, reflecting an initial yield of approximately 4.20%. The building was developed by Park Developments, a pioneering developer with vast and varied experience who have been involved with the development of over 950,000 sq ft of commercial schemes and circa. 20,000 homes in Dublin. Established in 1962, Park Developments have forged a reputation for building high quality commercial and residential properties. The recent completion of The Reflector displays Parks continued drive for excellence, emulated across some of their other schemes including: The Park Carrickmines, Hanover Quay and Mount Saint Annes. The Reflector benefits from a host of well-established amenities with numerous cafes on the doorstep, event centres such as The Bord Gais Theatre and The 3 Arena, within walking distance are a number of local hotels including The Marker, The Spencer and The Clayton. The area is well serviced by Dublin’s expansive public transport network with both Luas and DART services within a 10 minutes’ walk, Dublin Bike stations on the doorstep and multiple bus routes in the locality. The area has excellent road infrastructure with the Samuel Beckett Bridge providing speedy access to the North Docks, IFSC and to Dublin Airport. A new public transport bridge is also planned connecting Grand Canal Dock with Ringsend (included in DCC Capital Programme). Grand Canal Dock is Dublin’s principal modern office district and is resident to many internationally recognised occupiers. Occupiers within the immediate vicinity of The Reflector include State Street Bank, Accenture, AirBnB, Matheson, HSBC, William Fry Solicitors, McCann Fitzgerald Solicitors, BNY Mellon,Aptiv, Google and Facebook. With most of the buildings in the South Docklands now in long term ownership and with a distinct lack of opportunities, The Reflector presents one of the last opportunities for an investor to acquire a holding in Grand Canal Docks.